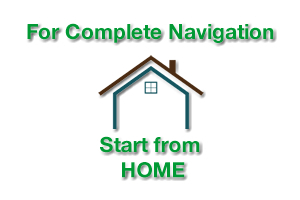 The 2011 NASCAR Sprint Cup Series season was the 63rd season of professional stock car racing in the United States. 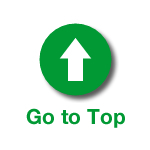 The season included 36 races and two exhibition races, beginning with the Daytona 500 at Daytona International Speedway and ending with the Ford 400 at Homestead-Miami Speedway. The final ten races were known as 2011 Chase for the Sprint Cup. 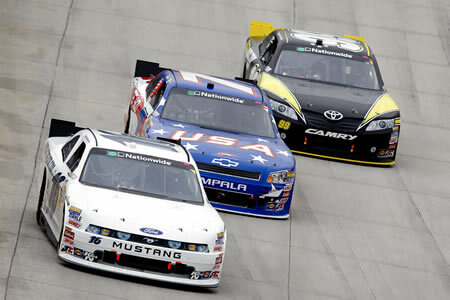 Tony Stewart won the Drivers’ Championship with a victory at the final race of the season in a tiebreak over Carl Edwards. Chevrolet won the Manufacturers’ Championship with 248 points. Photo: U.S. President Barack Obama (R), and NASCAR Champion Tony Stewart walk into an event on the South Lawn, April 17, 2012 at the White House in Washington, DC. 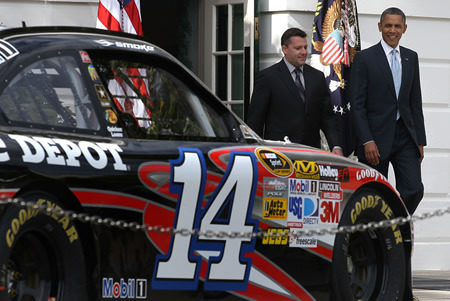 President Obama hosted the 2011 NASCAR Sprint Cup Series Champion Tony Stewart to honor his championship season. (Photo © Mark Wilson/Getty Images). Photo: Kevin Swindell, driver of the #16 RickyVsTrevor.com Ford, leads Josh Wise, driver of the #7 “We Salute You” Chevrolet, and Ryan Truex, driver of the #99 Pastrana Waltrip Racing Toyota, during the NASCAR Nationwide Series 5-hour ENERGY 200 at Dover International Speedway on May 14, 2011 in Dover, Delaware. (Photo © Todd Warshaw/Getty Images for NASCAR). 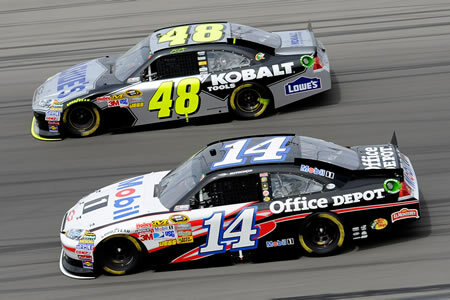 Photo: Jimmie Johnson, driver of the #48 Lowe’s/Kobalt Tools Chevrolet, races Tony Stewart, driver of the #14 Mobil 1/Office Depot Chevrolet, during the NASCAR Sprint Cup Series Kobalt Tools 400 at Las Vegas Motor Speedway on March 6, 2011 in Las Vegas, Nevada. (Photo © John Harrelson/Getty Images for NASCAR). 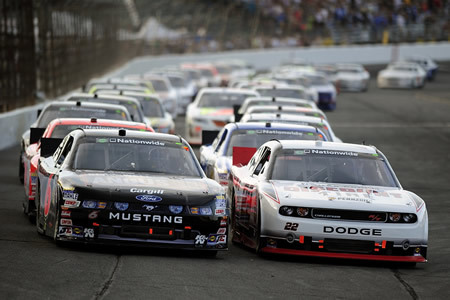 Photo: Ricky Stenhouse Jr., driver of the #6 Blackwell Angus Ford, and Brad Keselowski, driver of the #22 Discount Tire Dodge, lead the field into turn one during the NASCAR Nationwide Series Kroger 200 at Lucas Oil Raceway on July 30, 2011 in Indianapolis, Indiana. (Photo © Jared C. Tilton/Getty Images for NASCAR). 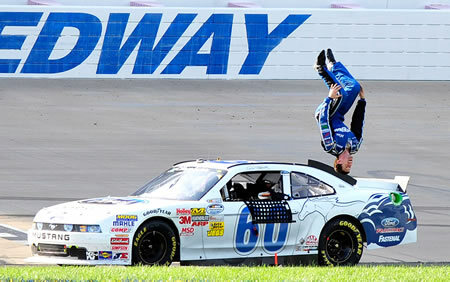 Photo: Carl Edwards, driver of the #60 Ford Drive one Ford, celebrates with a backflip after winning the NASCAR Nationwide Series 11th Annual Nashville 300 at Nashville Superspeedway on April 23, 2011 in Lebanon, Tennessee. (Photo © Grant Halverson/Getty Images for NASCAR). 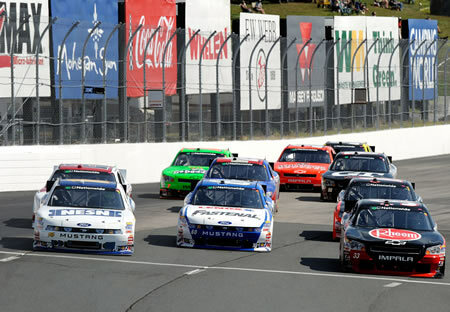 Photo: Trevor Bayne, driver of the #16 NESN Ford, races Carl Edwards, driver of the #60 Fastenal/Lenox Ford, and Kevin Harvick, driver of the #33 Rheem Heating, Cooling & Water Heating Chevrolet, three wide during the NASCAR Nationwide Series New England 200 at New Hampshire Motor Speedway on July 16, 2011 in Loudon, New Hampshire. (Photo © Jared C. Tilton/Getty Images). 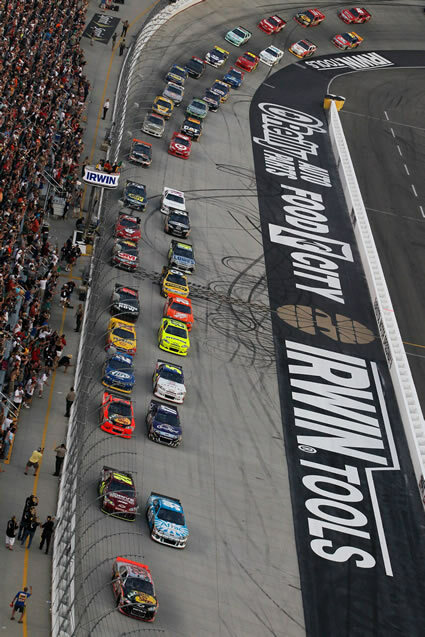 Photo: Ryan Newman, driver of the #39 Bass Pro Shops/Realtree Outfitters Chevrolet, leads the field at the start of the NASCAR Sprint Cup Series Irwin Tools Night Race at Bristol Motor Speedway on August 27, 2011 in Bristol, Tennessee. 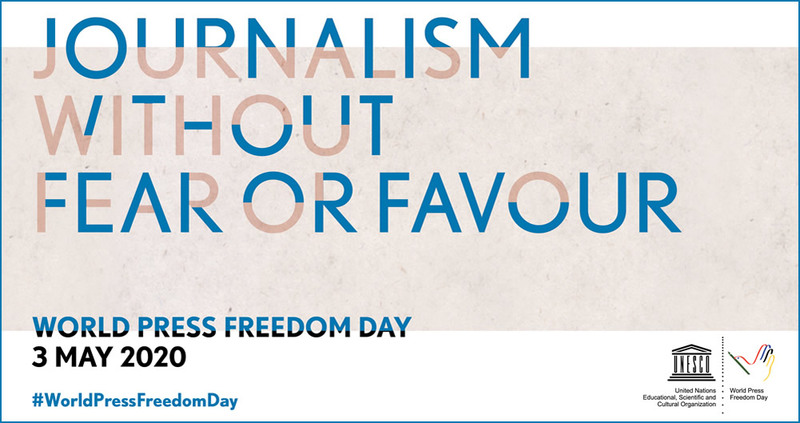 (Photo © Tom Pennington/Getty Images). 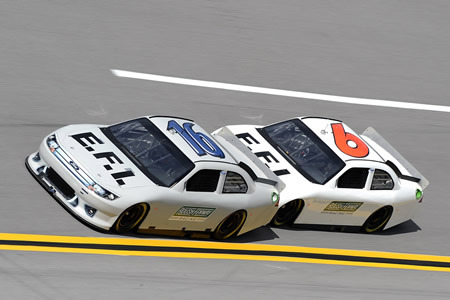 Photo: Trevor Bayne, driver of the #16 Roush Fenway Racing Ford, gets a push from teammate David Ragan, driver of the #6 Roush Fenway Racing Ford, during testing at Talladega Superspeedway on October 20, 2011 in Talladega, Alabama. (Photo © Jared C. Tilton/Getty Images for NASCAR). 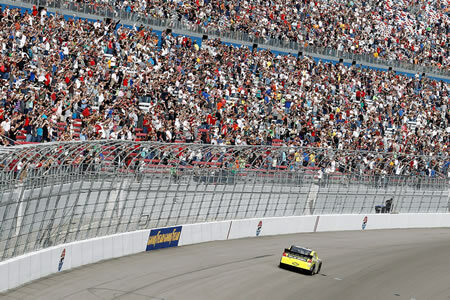 Photo: Mark Martin, driver of the #32 Dollar General Chevrolet, celebrates on track after winning the NASCAR Nationwide Series Sam’s Town 300 at Las Vegas Motor Speedway on March 5, 2011 in Las Vegas, Nevada. (Photo © Todd Warshaw/Getty Images for NASCAR). Photo: Jeff Gordon giving autographs during practice for the NASCAR Sprint Cup Series COKE ZERO 400 Powered by Coca-Cola at Daytona International Speedway on June 30, 2011 in Daytona Beach, Florida. (Photo © Geoff Burke/Getty Images). 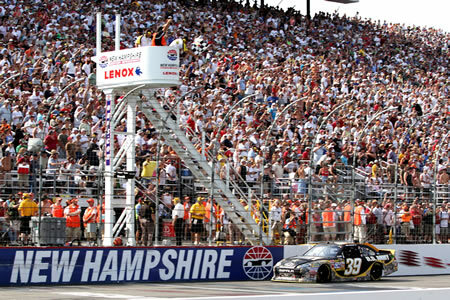 Photo: Ryan Newman, driver of the #39 U.S. Army Chevrolet, takes the checkered flag to win the NASCAR Sprint Cup Series LENOX Industrial Tools 301 at New Hampshire Motor Speedway on July 17, 2011 in Loudon, New Hampshire. (Photo © Jerry Markland/Getty Images for NASCAR). Photos: Eva Longoria serves New Yorkers first sips of new Pepsi NEXT— real cola taste with 60% less sugar. Today, Eva Longoria, actress and star of the hit TV show, Desperate Housewives, surprised New Yorkers with a first taste of new Pepsi NEXT, which, according to PepsiCo, is the first cola to deliver real cola taste with 60% less sugar than Pepsi-Cola. To continue fueling the “Drink it to Believe it” excitement, actress and star of Mission Impossible: Ghost Protocol, Paula Patton, will bring Pepsi NEXT to Los Angeles fans on Monday, April 9, the company further announced.